Please note that much of the information below is from our old website which was replaced in Jan 2015 and, as a result, it may no longer be entirely relevant. We are currently reviewing this and other information and converting it into PDF files, which will be available to view/download directly from our product pages. THose same PDF files will also be listed here once they are all completed. We don’t really like disclaimers, however sometimes they are necessary. Due to some of the information below being several years old (if not more), we must advise that in some cases it could be redundant or incorrect. As such we ask that you consider this when using any dimensions or measurements and either check with us first or wait for your goods to arrive and check your own measurements as required. All our buttons can be mounted in a 28mm diameter hole and will fit into panels up to 20mm thick, although a maximum of 18mm thick is recommended otherwise you’ll have trouble fitting the microswitches. As per the diagram to the right, we suggest that you space the buttons about 38mm apart from their centres. A smaller gap might make it difficult to mount the buttons correctly (especially if you don’t drill the holes exactly where they need to go) whilst a bigger gap puts them too far apart for your hand to comfortably span them. To cut holes in timber, use a 28mm Spade Bit in either a hand drill or drill press. They cost about $12AUD from your local hardware store. For drilling into metal you’d need a 28mm Hole Saw and some cutting compound. These can be rather expensive so an alternative would be to mark up your panel and take it to a metal shop and ask them to cut or punch the holes for you. In any case, use a powerful drill on a SLOW setting, and take your time. See the diagram at the right for measurements of our joysticks. A 20mm hole is ideal for the shaft of the stick to sleeve through. Rather than purchase a separate hole cutter just for one or two holes, you can use the same 28mm bit as on the buttons if you like – the joysticks come with a dust disc that will cover a hole that large. In metal or timber panels, drill holes 6mm or smaller for bolts at each of the 4 corners of the mounting plate, as per the diagram to the right. You then secure the joystick from underneath the panel then place the dust disc over the shaft and screw on the top. Alternatively, in timber panels you can use screws to secure the joystick into the underside of the panel. Just make sure you use screws that are a couple of millimeters shorter than the thickness of the panel so they don’t break through or make indentations in the top of the panel! The advantage in mounting like this is you then don’t have bolt heads visible on top of the panel. We will soon be adding infomation and pictures to help you with mounting our trackballs, so please check back. We often have customers asking about how to wire up their components and surprisingly there’s not much useful info on the internet about it so we decided it would be good to offer some. Hopefully it solves a few mysteries for you! **Make sure you read the WHOLE section so you don’t miss anything. You will notice in the some of the pictures that our wiring uses spade connectors, which are also known as quick disconnects. We use wiring like this for all our solutions, because they are very easy to connect and unlike soldering it allows for simple disconnection of wires if you ever need to replace a faulty microswitch or re-route your wiring for whatever reason. And of course we sell Wiring Kits to make life easier for you. Wire: We’re often asked what thickness wire is best to use. The answer is almost any – very little current is involved so you could use CAT5 cable if you wanted, although thin wires can be difficult to strip unless you have some very good wire strippers. We use 28AWG wire in all our solutions and wire of that thickness is readily available from electronics or auto parts stores. Regardless of the wire you use, always make sure when it’s stripped that you twist the strands together so the wire doesn’t fray. Not only is it then easier to put the wire where it needs to go, but it will also lessen the chances of there being any short circuits caused by stray strands of wire touching each other when they shouldn’t. Another useful tip, especially when wiring up an I-PAC, is to bend the stripped part of the wire into a U or hook. That way when you screw it into the appropriate terminal on the I-PAC it effectively has two wires to bite into, so there’s less chance of the wire coming out later on. Some only have 2 terminals and leave out the NC terminal – you can ignore the NC terminal if your microswitches have it, as you won’t need to use it anyway. The two terminals we are interested in are COM, to which you should connect the ground wire, with the other wire connected to the NO terminal. This means the circuit is open until the microswitch is ‘clicked’, at which stage the circuit is then closed and a signal is sent to the I-PAC (or whatever interface you’re using) for that input. Using these two terminals in a standard manner makes it easier to trace any problems you may have with your wiring. So what on earth IS daisychaining? The easiest way to explain it is in picture form, so have a look at the picture to the right and hopefully that explains it. Put simply, daisychaining is the easiest way to hook up all the ground connections to the microswitches of your pushbuttons and joysticks. That way you only end up with two or three ground wires to connect to your I-PAC or other interface, instead of over twenty. If you are using our wiring kit, you’ll notice the ground wires only come in groups of either 4 or 10. So how do you keep the daisychain going? As per the picture to the left, the microswitch terminals have a small hole in them. So what you can do is strip the lead-wire of the next group of ground wires, put the end through the hole in the terminal then slide the quick disconnect onto the terminal. This will keep the wire in place so you can continue the daisychain. 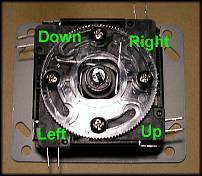 Firstly, the microswitches are located at the corners rather than at the “compass points”. Secondly, Up and Down are reversed! Rather than let you get it wrong just so we can have a chuckle about it, the picture to the right is designed to make life easier for you. All keyboard encoders come with a CD containing useful info and various drivers, however if you misplaced the CD you may still need some of the info that it contained. Just click HERE to open a new window with details on how to download the various Ultimarc utilities. Note that if you require drivers for the ArcadeVGA card they are NOT downloadable from Ultimarc’s website. We do have them available for download, however due to the size of the files we don’t link them directly. If you need a source for the ArcadeVGA drivers then please e-mail us and we will provide you with a link so you can download the necessary files.